For the past 15 years, the Réserve Naturelle has worked hard to ensure the success of its missions for environmental protection, promotion, and awareness. It keeps a close eye on various sites on land and at sea, to make sure they remain well managed and natural. The importance that I attach to our natural environment is every bit as imperative as the challenges we face in the 21st century. I am pleased that I was able to address this subject during the Caribbean Climate Conference in Fort-de-France on May 9, 2015, with the president of France and the minister of the environment in the audience. On a national level, France is committed to the fight against climate change and by working together we can improve the current situation. Just as by working together locally, we can make sure our island is more beautiful, cleaner, and more welcoming. At first glance, many of you might wonder what a member of the public prosecutor’s office is doing writing the editorial for a magazine about the Réserve Naturelle of Saint Martin. On the surface, our functions are so very different, from sanctioning and punishing on the one hand, to protecting flora and fauna on the other, that one might actually wonder what we talk about when we meet. The Nature Reserve’s project to create a Ma-rine Biodiversity Institute holds a privileged position in the European Operational Pro-gram 2014-2020, and I am very pleased about it. Besides the fact that it will further enhance the environmental protection that is already in place, this new center is an important asset for the creation of new career paths and the promotion of ecotourism on the French side of the island. My team, partners and I have wor-ked together with the Reserve on defining this project in order to dispose of a truly effective tool. I am delighted to share the news of our beautiful Reserve and its team whom I congratulate on the quality of their work and their implication on all fronts. Nothing is fixed at the Reserve, missions follow one after the other without interruption, and each one is carried out with great dynamism. 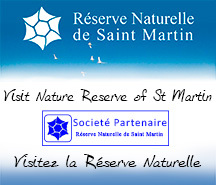 The track record,15 years later..Founded in 1998, the Saint-Martin Nature Reserve is celebrating its fifteenth anniversary this year. I realize how far it has come and how much work has been accomplished since its creation. Thanks to our local, regional, national, and international partners, and particularly the préfecture of Saint-Barthélemy and Saint-Martin, our island has become the key platform, the hub, for dealing with environmental problems. After having been away for three years, during which time I was managing other marine protected areas, and implemented the AGOA sanctuary for marine mammals in the French Antilles, it is with great pleasure and enthusiasm that I return to the Saint-Martin Nature Reserve and its team. And with pride I note the presence of many sea turtles in our waters, better coral cover, a greater abundance of fish, and a greater recovery of mangroves on the banks of certain salt ponds. 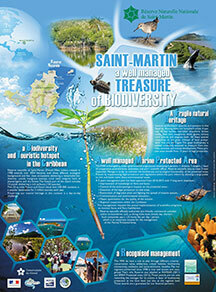 Saint-Martin has an exceptional natural heritage.. The Nature Reserve and the Conservatoire du Littoral (Coastal Conservancy) protect these natural areas for us. Beyond the protection of our biodiversity, they also guarantee our quality of life and maintain the beauty of the island as a tourist destination. Preserving these areas is a major challenge for our country.